Please fill the form out below or download and complete this printable membership application. A business/commercial membership with one designated voting member with three (3) votes, the eligibility to serve on the Board of Directors and any committee. Open to civic groups, organizations and persons not engaged in commercial activities. Entitled to one (1) vote and eligible to serve on the Board of Directors or any committee. 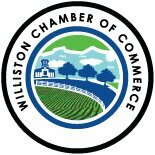 Open to all persons who do not represent a business, but who are interested in the betterment of the Williston community through Chamber activities. Eligible for one (1) vote, committees and Board of Directors. Donations may be made in any denomination you wish i.e. $25.00, $50.00, etc. Instructions: Any full member volunteering (below) 2 hours to a Chamber event or project during the year will receive a $25.00 credit toward the following year’s dues. If you wish to participate in this program please initial below.